Land Destroyer: Can Pan-European Hysteria Save NATO's Syrian War? Can Pan-European Hysteria Save NATO's Syrian War? November 2, 2015 (Tony Cartalucci - NEO) After over a decade of war and destabilization waged by NATO stretching from North Africa to Central Asia, with the recent destruction of Libya and the 4-year war NATO and its regional partners have waged against Syria, an influx of refugees, following the trail of their conquerors back West was all but inevitable. 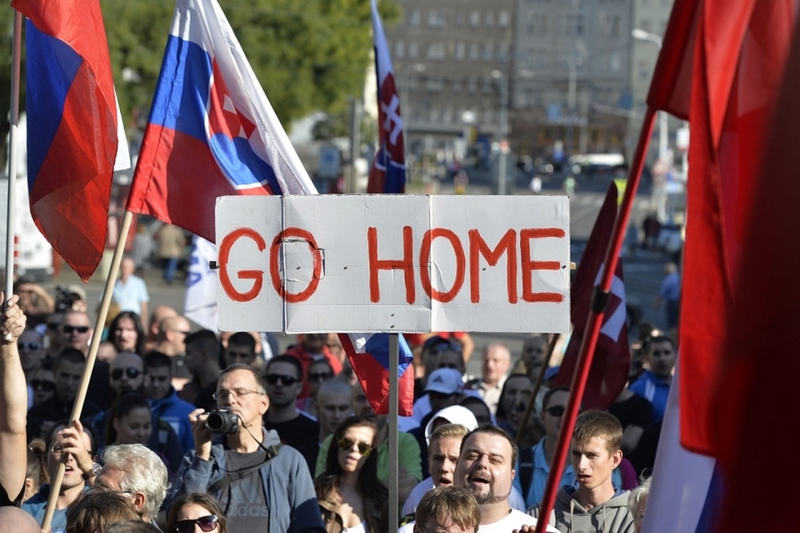 Image: Western leaders, pundits and politicians are actively encouraging growing tensions between opponents and supporters of migrants streaming into Europe. The West is intentionally stirring up chaos, but to what end? However, evidence suggests that the latest influx of refugees is more than a mere predictable consequence of destroying entire regions of the planet with war and state-sponsored terrorism. In Turkey, where the US, EU, and Ankara itself have inexplicably invested billions of dollars in the construction of refugee camps of unprecedented scale, reports indicate that torrents of refugees have been intentionally organized and sent onward to Europe. A sharp increase in the influx of migrants and refugees, mostly from Syria, into Greece is due in part to a shift in Turkey’s geopolitical tactics, according to diplomatic sources. These officials link the wave of migrants into the eastern Aegean to political pressures in neighboring Turkey, which is bracing for snap elections in November, and to a recent decision by Ankara to join the US in bombing Islamic State targets in Syria. The analyses of several officials indicate that the influx from neighboring Turkey is taking place as Turkish officials look the other way or actively promote the exodus. It is clear that huge torrents of refugees and migrants are being intentionally brought into Europe to augment an already very real migrant crisis, in a manner designed specifically to provoke emotions - fear, hatred, hysteria among the far-right, and irrational sympathies among the far-left. To expand upon those emotions, many European governments - many of whom have directly contributed to the wars that have driven many of these migrants from their homes to begin with - have instituted intentionally permissive immigration policies designed not only to provoke fear and uncertainty among insecure, xenophobic European populations, but to encourage migrants to continue streaming in, even those not affected directly by Western wars, invasion, occupation, and proxy terrorism. 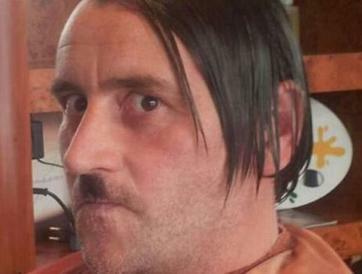 Image: Lutz Bachmann dressed like Adolf Hitler. The same special interests that have engineered the wars and devise policy for sitting European governments, are also cultivating far-right groups like Pegida in Germany and the English Defence League (EDL) in the UK. These groups consist of literal Neo-Nazis, with Pegida's leader, Lutz Bachmann, caught literally dressed like Adolf Hitler - the Nazi leader who led Germany to its utter destruction during World War II. Such groups also consist of more "muted" racists and bigots, and in addition to them, a growing number of xenophobes driven into hysteria by demagogues and daily media sensationalism. It should be remembered that the extremists and terrorists Pegida and the EDL warn against, are in fact the intentional creations and perpetuation of the very same corporate-financier and political interests that support far-right racist organizations in the first place. That such extremists consist of a fraction of 1% of all Muslims on Earth doesn't matter to them. Image: While many try to dismiss claims Germany's Pegida organization consists of Neo-Nazis, their own words and actions prove otherwise. Pegida, the EDL, and their affiliates in America and across Europe are run and supported by many familiar names among the Neo-Conservative pro-war establishment - special interests whose policy think-tanks represent some of the largest defense contractors, equity firms, engineering contractors, and financial institutions on Earth - and the same handful of interests that have propped up state sponsors of terrorism including Saudi Arabia for decades. 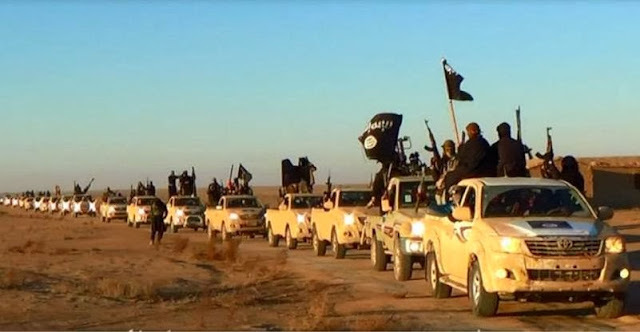 Image: ISIS drives in a fleet of brand new Toyota trucks, courtesy of the US State Department and their Saudi, Turkish, and Jordanian allies. What is taking form is a controlled strategy of tension, where far-right groups are being arrayed against the migrants and their European supporters, to create hysteria and eventually violence that will be leveraged by those who orchestrated it. But leveraged to what end? Creating a "safe zone" Europe can send all the refugees back to. It is clear that many of the refugees are not even Syrian - but that has not stopped a growing chorus of pundits and politicians from claiming that the only way to solve the growing migrant crisis is to use Western military force to carve out and occupy a "safe zone" in Syria to send all the migrants back to. It is clear that the migrant crisis is being used to serve as impetus to justify further war abroad and greater state control at home. Evidence also suggests that the migrant crisis has been at the very least intentionally exasperated by Turkish efforts to empty out immense camps they appear to have built specifically to use as political bargaining chips. The crisis is also compounded by intentionally permissive immigration policies in Europe and organized Neo-Nazi fronts designed to maximize fear, panic, and hysteria regarding the predictable influx of migrants such policies are sure to invite. 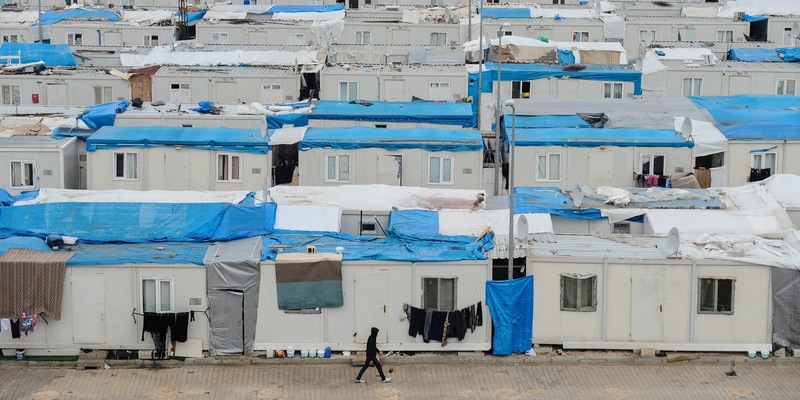 Image: Turkey boasts of its multi-billion dollar refugee camps it has constructed along its border with Syria. It appears that these are also operational bases, recruiting centers, and staging points for NATO's proxy war on Syria and now its "migrant crisis" scheme. NATO hopes that the mess they have created is so convincing that the people of Europe and North America eventually beg them to carve up Syria to "send the migrants home." Unfortunately for Europe, the migrants are not going home. Worse still, more are on their way - as NATO never planned to stop at Syria, just like it never planned to stop at Libya. Intentionally bringing in a torrent of migrants - intentionally ensuring there is no way to properly process, feed, and shelter them - solely for the purpose of creating as much chaos as possible to justify even further war abroad can only lead to catastrophe. Creating and controlling oppositions built on Neo-Nazism and naive liberalism, ensures that the true cause of the problem and meaningful solutions are never arrived at and that the peoples of Europe and North America are dragged deeper into ignorance, fear, and exploitation. Europe can - if they honestly sought to - integrate the migrants flowing into their borders. To ensure the flow stops, Europe can easily withdraw from NATO, expose and cease support of US ambitions in Syria, Afghanistan, Iraq, Libya, and beyond, ending the wars and returning the Middle East and North Africa to peace and stability. To guard against extremism, Europe could expose its source, in Riyadh, Doha, and Ankara, and demand that their American allies cease all support of such regimes. Image: NATO has desperately sought to establish "safe zones" inside of Syria as part of a wider plan to divide and destroy Syria as a whole. 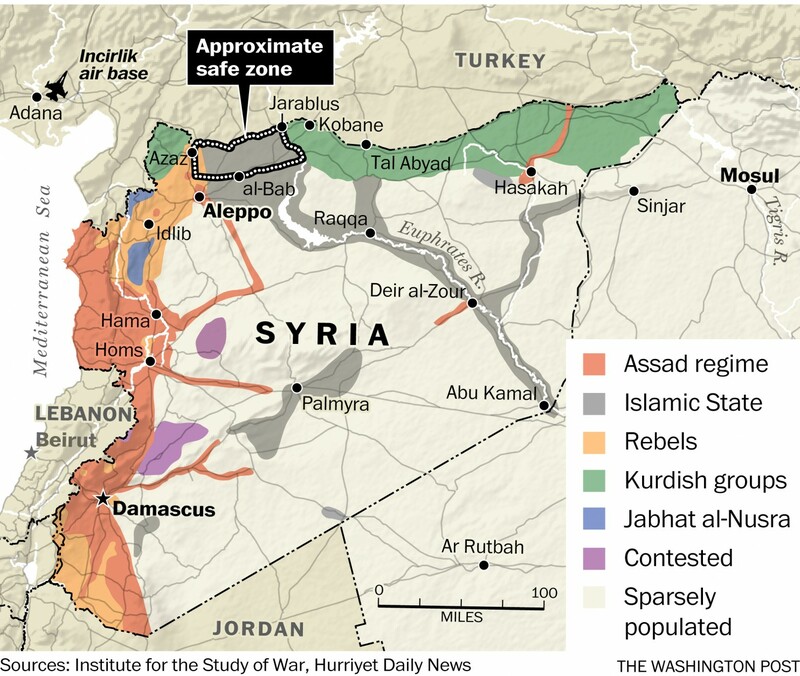 While the pretext to establish this zone has changed over the years, the actual goal has always been the same - to protect logistical lines and operational bases of the terrorists NATO has used to wage proxy war on Syria. Note how the "safe zone" encompasses the last viable corridor supplying ISIS. But that Europe has joined America in sanctioning Russia for its resistance to a violent putsch carried out on its border in Ukraine, instead of sanctioning Saudi Arabia - the chief sponsor of Al Qaeda and ISIS, indicates that Europe's current condition is terminal. For those that believe the Middle East is incapable of peace and stability, it enjoyed as much for centuries under the Ottoman Empire. Strong, secular national governments like what existed in Syria and Libya before the wars, kept extremism and fleeing migrants in check. If Europe wants to alleviate their current crisis, it would be in their best interest to restore those governments, strengthen them as Russia is currently doing, and work with them as partners rather than seeking to install and prop up proxies. Finally, for Russia and Syria, it would be in their best interest to ensure that the facts on the ground make such "safe zones" impossible. Syria's refugees must return to the nation of Syria - not a Balkanized, fractured, destroyed, conquered failed-state like NATO left within Libya's borders. In all likelihood, NATO's scheme regarding Syria will only create more refugees - one needs only to look at Libya and how people are still fleeing the mess NATO intervention created in 2011. 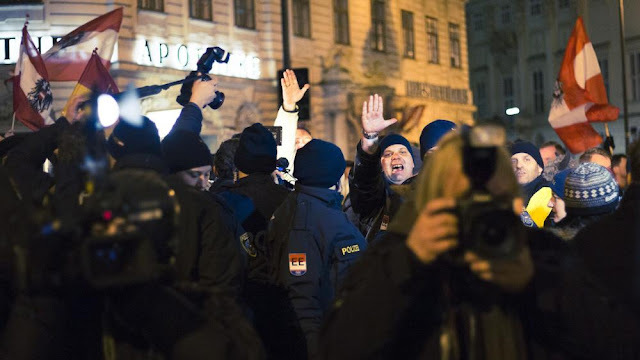 It is the year 2015, and that Nazism still infects the streets of Germany, is a telling sign of what prevails politically and socially in the West. The civility the West claims it is imposing on the rest of the world at the barrel of a gun, is absent in its own streets. The migrant crisis is not the cause of what ills Europe. It is just another in a long line of symptoms. For those who think this ill-devised scheme will save an equally ill-devised proxy war, the real question should be, even if Syria does fall, for the ugliness and treachery the West has now openly displayed before the entire world, at this point, would it matter?